Who doesn’t love a delicious chicken schnitty? If you are looking for something easy, healthy and affordable to cook tonight, look no further. The Pulse is sharing delicious recipes as part of our delivery of NSW Health’s Make Healthy Normal campaign at Western Sydney Local Health District (WSLHD). Preheat over to 220 degrees. 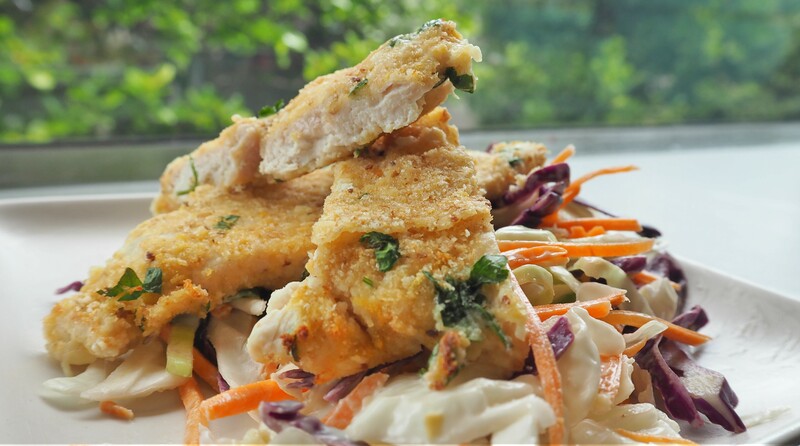 Coat coleslaw vegetables with dressing and set aside to soften while preparing the chicken. Combine breadcrumbs, parmesan cheese, lemon rind, parsley and garlic on a plate. Place flour on another plate. Whisk egg and milk together in a large shallow bowl. Using a rolling pin, pound each chicken breast between two sheets of plastic wrap until thin. Coat each chicken breast in flour, shaking to remove excess. Dip in egg mixture and then coat in breadcrumb mixture. Bake chicken in preheated over for 5-7 minutes, and then flip chicken over. Bake for another 5-7 minutes until lightly browned. Serve with your coleslaw. TIP: If the chicken breasts are thick, you can slice them in half. For more healthy tips and recipes visit makehealthynormal.nsw.gov.au. A get healthy service is also available – sign up to your free telephone coach today (16 years and over). Call 1300 806 258. If you’re a parent with a child aged 7-13 who is above a healthy weight range, sign up to our free ten week healthy lifestyle program: go4fun.com.au or call 1800 780 900.